Copyright, 1890, by John F. Ellis & Co. Written and Composed by Will S. Hays. They wished that he would move away, or that his goat was dead. They Couldn't tell just When or where that goat would pop up next. Now you can bet your coat that if there's fun afoot. Have tried 'most all their lives to find and kill O'Grady's goat. "Go, git yer goon an' shoot the baste, O'Grady's goat doon that." -Chorus. Were chewed off almost to the neck-O'Grady's goat doon that.- Chorus. 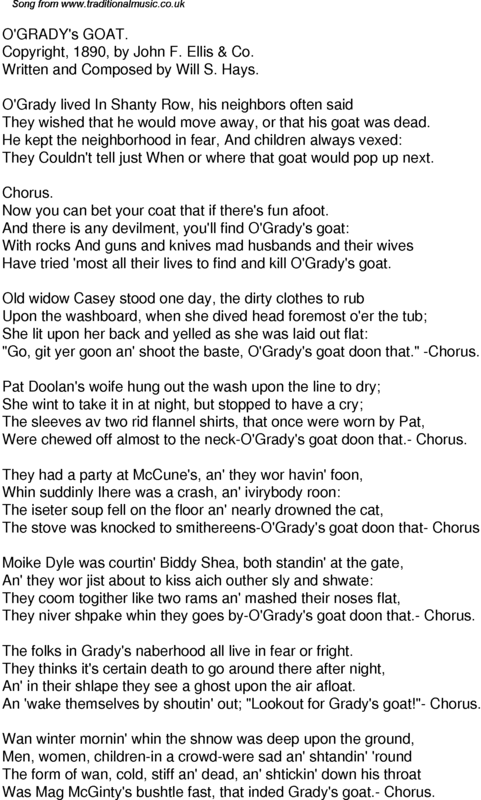 They niver shpake whin they goes by-O'Grady's goat doon that.- Chorus. The folks in Grady's naberhood all live in fear or fright. An' in their shlape they see a ghost upon the air afloat. An 'wake themselves by shoutin' out; "Lookout for Grady's goat! "- Chorus. Was Mag McGinty's bushtle fast, that inded Grady's goat.- Chorus.